Here are three creeping & creepy freedom & financial risks. As Halloween approaches we think about orange and black decorations. Our thinking should be about other creepy things that include creeping risks to our freedom & financial freedom. 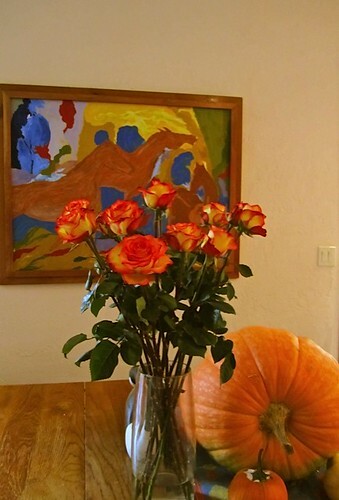 See how to order Halloween roses now. Here are three really creeping and creepy risks. Why diversify and have two places of residence? The answer is to have options! Things could go wrong in Ecuador. In Ecuador my impression is that the political system is nowhere as bad as the Western press make it out to be… yet if I am wrong… or some other bad event takes place in Ecuador that makes it unsuitable for us, Merri and I have an option. I do not want to be stuck with everything invested in Ecuador… or in the USA or in any one place… anywhere. By now almost any thinking person can see raging inflation looming ahead. They can see the US dollar falling. Yet there are many more American problems I keep my eye on… like the loss of our basic rights to financial freedom. A creeping attack has been in progress for more than 30 years. For most of that time, I have been warning about the insidious tactics that the US and other governments have used to erode financial privacy and personal liberty and pointed out that the problem is that the government does not attack the individual but puts the pressure on the overseas financial institutions. Regretfully these warnings have been spot on and today, most overseas banks no longer accepts US clients. The point here is that this did not happen overnight. The process has taken over 30 years. Take for example the rule that the US military cannot operate in police actions on US soil. This is a good rule… yet look at this. For example I have been watching the press already starting to build a Flu scare as they do each autumn. They are at it right now with… “Watch out for flu this fall.” The press, knowingly or not, is preparing the public to buy into flu vaccine.. good for pharmaceuticals… but maybe not so good for the individual. Whether the press publishes this type of stuff because fear sells papers or for some hidden agenda, I do not know. I am not a conspiracy theorist… but I do know that history suggests that no republic lasts in a state of harmony for very long. So I read with great concern an article in the science section of the New York Times entitled “Climate Change Seen as Threat to U.S. Security” by John Broder. The implication is that anything to do with climate change could be viewed as a threat to national security and that more normal, democratic rights to … privacy… presumption of innocence… right to an attorney, etc. will be reduced in the name of climatic national security. I hope I am wrong about this. If not, is there anything I can do about this? Not much… but live in a positive way that is as good for as many as is possible. I can do my best to be ethical and prepare, so if living conditions shift badly in the US… there is always Ecuador. I doubt things will get so bad in the US that I would not want to live here anymore. I doubt things will get so bad in Ecuador that I would not want to live there anymore. I hope not but I have options and so should you. A September 30, 2011 LA Times article “Ron Paul criticizes Obama for U.S. role in killing of Awlaki” looks at this problem when it says: Ron Paul, the Texas congressman who is seeking the GOP presidential nomination, on Friday criticized the Obama administration’s action in killing Anwar Awlaki, the American-born cleric who advocated jihad against the United States. Awlaki, a prominent voice in Yemen’s Al Qaeda affiliate, and Samir Khan, an editor of a jihadist magazine, were killed in an air attack in Yemen by what U.S. and Yemeni officials say was an operation that involved U.S. military and intelligence assets. Paul told reporters that Americans need to think about such actions because Awlaki was born in the United States and was entitled to the same rights as all U.S. citizens. Paul went on to compare the situation to Timothy McVeigh, convicted of blowing up a truck bomb at the Alfred P. Murrah Building in Oklahoma City on April 19, 1995. The attack killed 168 people and injured more than 800 people. Ron Paul went on to suggest that the United States could assassinate journalists the same way it targeted Americans with ties to al Qaeda. This seemed pretty outrageous until recently I discovered another creeping regulation aimed at the internet. So many people want to keep the internet free that politicians might be afraid to put regulations restricting the freedom of the press. Are they trying in other ways? I was recently shocked when one message I posted to send to you was not sent by our autoresponder. This is an important part of an internet business because it is not easy to send up to 30,000 emails a day and not be treated as spam. In short, the autoresponder has to keep its reputation and image clean. Otherwise all emails sent by such a company could be filtered as spam by the major service providers. In short, one bad customer could cause all of an autoresponders customers to be stopped. The article was entitled Multi Currency Tip: Sell Australia & Brazil. You will not post on the Website, including in any Emails created or sent using our …. Online trading, day trading tips, or stock market related content. My article certainly did not give any online trading or day trading tips… but did have stock market related content. That’s such an ambiguous phrase… “stock market related content”. As one of the few sites who recommends to still bank abroad, I had to scratch my head and ask, “Why now?” We have thousands of pages about stock market related material at our website. We are really great customers and never send spam, so “Why now?” I asked. My understanding is that new pressures have been put on the autoresponding companies. This is worrying. All the autoresponding companies and Google are responding to FTC “guidelines” that make them nervous to run content and ads for certain types of companies, etc. This is akin to saying the government can’t regulate what the press can say but can regulate what papers are allowed to be carried on the roads. This is a complicated issue. There is no doubt that there is a lot of email content we do not want spammed to us. However there were many disreputable overseas banks as well. Did we really want them so regulated that almost no overseas bank will accept Americans as customers? There are people we do not want getting on airplanes with knives, etc. Yet do we all want full Xray body scans every time we fly? Obviously we have taken steps to protect our business and our freedom to write about whatever we wish. But taking in 30 years of experience I have to ask… are there creeping restrictions on the internet that could limit our financial freedom even more? This means that the advice we provided starting more than three decades ago remains more valid than ever. Have a multi country posture so you always have options. Learn how to have a multi country posture that creates multi currency investments and income at our courses and seminars in 2012.